In typography, justification is the alignment of the edges of a block of text. Text can be “flush left”, indicating that the left edges of the lines are aligned with each other and the right edges are ragged–i.e. not aligned. Text can also be “flush right” (right ends of lines are aligned), “justified” (both edges line up), or centered (both edges ragged). 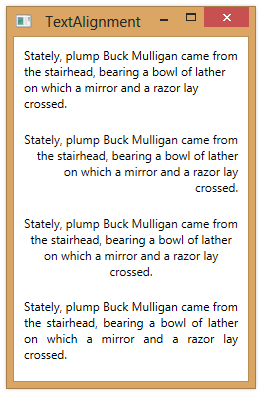 WPF allows justification of text using the TextBlock element. You specify justification in a TextBlock using the TextAlignment property, setting it to one of: Left, Right, Center or Justify.